The Galapagos Islands are a perfect honeymoon destination for couples who love nature and are looking for an adventure off the beaten path. The Galapagos Islands are an archipelago of volcanic islands in the Pacific Ocean and part of the country of Ecuador. The islands are famous for being the place where Charles Darwin conducted his famous research on the theory of evolution due to the large number of species which are unique to the Galapagos. Nature loving couples would find no shortage of things to do. Honeymooners who visit the Galapagos Islands will have the opportunity to see and interact with a vast variety of plants and animals that are not able to be seen elsewhere in the wild. Scuba diving and snorkeling opportunities abound and the beaches will take your breath away. 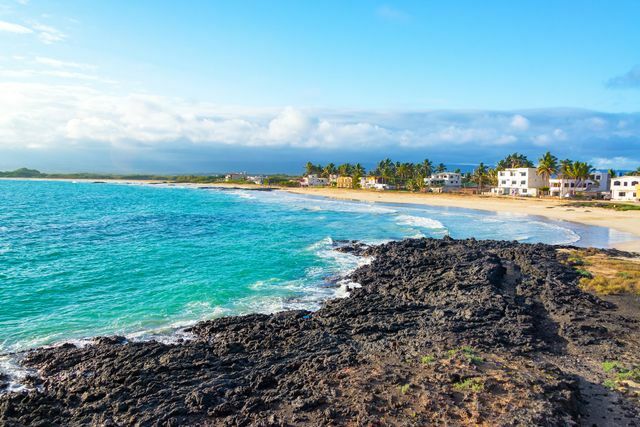 From camping on a private beach to spending your night on a luxury yacht, the Galapagos Islands can provide you with just the honeymoon you are looking for and would certainly be an adventurous and romantic place to visit. The wildlife on the Galapagos are present year round, so there is always something wonderful to see. However, if there are specific mating, nesting or birthing seasons that you want to see, you should plan accordingly. There are two seasons, cool and dry or hot and wet. Santa Cruz Lava Tubes: Extensive tubes underneath Santa Cruz which were formed lava and can extend more than 2000 meters in spots. Los Tuneles: Naturally occurring stone tunnels that are under and above water. A large variety of marine life inhabit the area. Kicker Rock: Two large rocks which jut out of the sea. Best place to see the Galapagos Shark. Las Grietas: Two large cliffs with a crack in between them. Visitors can swim in the cool ocean water between the two cliffs. North Seymour Island: Great place for bird-watching and for viewing iguanas. Has a two-kilometer walking trail.